LG 3D adverts ruled to have been misleading | What Hi-Fi? 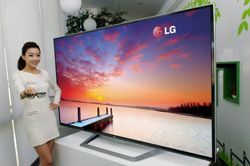 LG has been told to withdraw some of its existing 3D TV adverts and make it clearer that the company's TVs use passive 3D technology. The ruling, by the Advertising Standards Authority (ASA), stated that certain ads, which described the passive 3D TVs as "full HD 3D", were misleading. The text of the ruling stated: "We considered that the fact that the LG 3D TV used passive technology to achieve the Full HD effect was likely to be [a] factor that would affect a consumer's decision to purchase the product. "We therefore considered that, without further qualification to indicate that the Full HD resolution was delivered using passive technology, ads... were misleading." Samsung Electronics, LG's Korean rival, brought the claim, arguing that the use of "Full HD 3D picture", "FULL HD 1080p" and "HD 1080p" were misleading in adverts for 3D TVs where passive technology – which halves the resolution when watching 3D content – is used. Samsung also challenged LG to substantiate its claim that "you can sit where you want, how you want and you'll still get the same immersive viewing experience". This claim was not upheld, the ASA ruling in LG's favour by arguing the TV could be viewed in 3D by the average consumer in a realistic viewing position. The offending ads have been removed, with LG told "to make clear that its product uses passive 3D technology".